Veronica Lanier sent in this shot. "I've been a HUGE Phantom Regiment fan since I was 12 (I'm 24 now). I was never fortunate enough to experience drum corps firsthand, but I like to get as much of the audience perspective as I can. I am a four-year drum major at Arkansas Tech University in Russellville, Ark. 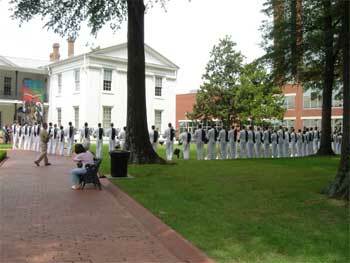 "The picture I included is from Phantom Regiment's July 28 standstill performance in front of the Old State House in Little Rock, Ark. They were kind enough to let anyone come out and watch their rehearsal and did two run-throughs. They are AMAZING to say the least and their bronze medal at championships proved it." Thanks Veronica! E-mail your best shots from the summer to dave@dci.org along with where and when the photo was taken. Send some biographical information about yourself as well. We'll give you full credit. Also, let us know if you want your e-mail address included.